Saujana Villa Condominium comprising of 300 deluxe residential units in 10.8 acres of landscaped environment, is solely owned and managed by Jayamore Corporation Sdn Bhd (203515D). Located approximately 26 km away from Kuala Lumpur city center in the tranquil greenery of Saujana Resort, yet we are conveniently linked to the thriving business and entertainment hub via a rapid network of main highways. Major shopping centers, recreational facilities, golf courses and entertainment centers are situated within close proximity. 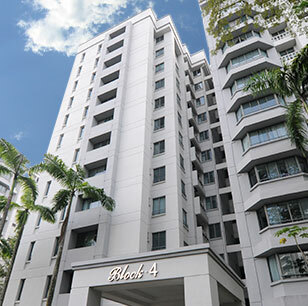 Being solely owned and managed, Saujana Villa Condominium has always been one of the finest residence of choice among many expatriates in Malaysia offering a safe, comfortable and luxurious home away from home. We provide 24-hour security services, Housekeeping service and an array of enticing amenities and facilities within the residence compound to create a comfortable and secured living. We offer a short-term leasing on weekly and monthly basis to those seeking free & easy lifestyle in a truly Malaysian resort-style environment. Special Corporate Rate is also available to corporations wishing to appoint us as a preferred accommodation venue for their business travelers and associates. Saujana Villa Condominium is also the perfect place to stay for those golf enthusiasts. Surrounded by the world renowned golf courses, you can step into the magnificent lush greenery anytime of the day. We offer privilege leasing of golf membership at Glenmarie Golf & Country Club (GGCC) and Saujana Golf & Country Club (SGCC) to our tenants and special preferred rates are also available for valued tenants.